Just like the squirrels I watch as I jog near my rural Missouri home each morning, every fall I get the urge to store away provisions for the coming winter. It’s a feeling I’ve experienced as far back as I can recall, and I tend to believe it’s the caveman deep inside me that pushes me to squirrel away food. I’m not alone in my paleo tendencies. Over the centuries peasants and kings alike have made plans for coming lack. Native Americans harvested bison and other meat and then dried the edible goods over a smoldering fire to preserve it for later use. Colonists brought with them to America the practices of storing domestic grown vegetables and fruits in root cellars or covered in beds of straw or lime. For the homesteader, or any rural resident, having supplies on hand is the way to survive when you live more than five miles from the nearest Walmart. We’re not just talking food items either, although that’ll be the focus of this article. Rural residents are wise to also maintain stores of nails and other hardware, oil and garage supplies, basic home repair goods, first-aid stuff, and even money. Making provision is a year-round lifestyle. My family utilizes a large chest-type freezer, a root cellar, a walk-thru pantry, and additional storage in a “clean room” in my workshop. In the summer we grow a garden and freeze or can surplus vegetables. We have a small orchard in our front yard that produces apples and peaches, which can be sliced and either frozen or dehydrated and bagged. Our hive of honey bees work all summer to pollinate our plants and store up enough honey to sweeten our baked goods and desserts for the following year. But putting up provisions isn’t just about saving what you grow. We like to fish and we clean and freeze part of our catch each year for enjoying at times when the bite isn’t on. I’ve hunted all my life, and am adamant that no animal I harvest goes to waste. I prefer the lean meat of wild animals to the force-fed, fat-laced domestic meats found at the grocery store. We also pick, bag, and freeze berries like blackberries, blueberries, and strawberries for use in pies and other goodies throughout the year. We gather and crack walnuts, hickory nuts, and pecans to be baked into breads and cookies, or used as toppings for ice cream or salads. Fall and winter days are made for “nutting”, the hobby of roaming wooded areas and collecting edible nuts. After all, millions of squirrels can’t be wrong … right? Seriously though, pulling on a warm jacket and a comfortable pair of walking shoes and grabbing some sort of bag to carry your find is the start of a great day. The air is brisk and clean, the leaves are crunchy under foot. When finished you’ll have taken a good walk, filled your lungs with healthy air, and have a bag of treats to shell and use to help make baked goods, or salad, or ice cream all the better. What nuts are the most plentiful and tasty? Unfortunately, the two criteria don’t always go together. In my neck of the woods the most plentiful nut is the acorn. While the squirrels and deer don’t seem to mind them, I’d have to be awfully hungry to ever set out to eat my fill. The tiny capped nuts can be horrendously bitter. But there are ways to make them more palatable, which I’ll discuss a little later. While wild nuts can be found nearly anywhere, the focus of this discussion will be the United States… more specifically, the central U.S. Some areas such as the west coast, deep south, or desert region will have some nuts specific to those locales. But nearly anywhere in the continental U.S. you can find four nut species: walnut, hickory, pecan, and acorn. Here’s a look at the nuts you might find on or around your rural property this time of year. 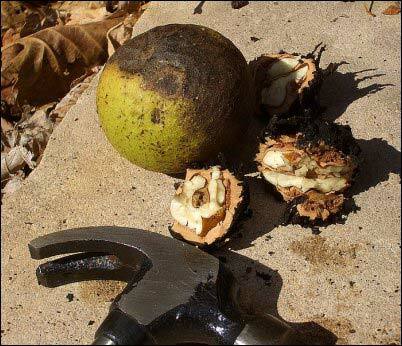 The black walnut is perhaps the ideal nut. The taste of the meat—the edible center—compliments many foods. They fall from the tree, which requires little effort and no specialty gear to harvest. Plus, they have a long shelf life, making for ease of handling. Naturally-occurring walnut trees can be found in many wooded parts of the country, especially the Midwest and eastern states. The bark of the tree is a dark black compared to a hickory or oak. The leaves consist of stems of rows of opposing single-bladed pointed leaves topped by a single leaf at the stem’s end. Early in the fall the leaves will turn yellow and begin to drop. The walnuts, still encrusted in the smooth green fleshy skin, will hang on for up to several weeks before releasing from the branches. Once detached from the tree and on the ground the husk will begin to dry, shrivel and turn black. 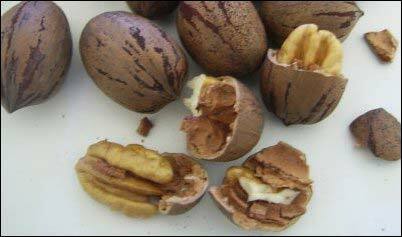 Walnut trees grow plentiful because of the amount of seeds a tree produces. Left uncollected, or uneaten by squirrels, the nuts can take root and begin the life cycle all over again in good numbers. Walnut lumber is a favored commodity in the furniture industry, and therefore the trees are desirable when wooded acreage is harvested. But, surprisingly, it wasn’t the furniture industry that nearly wiped out the black walnut population in the United States. It was war. Through the early and mid 1900s during World War I and II, black walnut was harvested at an alarming rate to make gunstocks for military rifles. Not that it affects the nut population now, because the black walnut population has rebounded, but it’s still a little-known bit of trivia. Once you find a stand of walnut trees the next step is to collect the bounty. I suggest you wear a pair of rubber gloves, because the stain from the deteriorating husks will leave your hands marked for weeks. Collect as many nuts as you want. Feed sacks or heavy duty trash bags work well. Next, remove the hulls. I’ve seen or done it four different ways and I’m sure there are others. The best I’ve found is to dump the collected nuts in the driveway and drive over them for a couple days. While it might not be acceptable in a subdivision in the ‘burbs, it’s perfectly acceptable on a gravel driveway in the country. The next option is to put on some old boots and stomp the hulls off the nuts. While it might sound simple and even fun, it’s not as easy as it sounds and will end up mashing the hulls into the hard nut covering and still require further cleanup. If you have the time to devote to it, simply take a knife and cut a line around the hull as if you were cutting open a peach. It’s labor intensive but likely the most straightforward method. The final, which may not work for everyone but is a great fix for any homesteader with the right piece of machinery, is to dump the collected nuts into a gas- or electric-powered concrete mixer and let it churn for ten or fifteen minutes. The action will beat the hulls from the nuts with no manpower required. With the hulls removed, spread the nuts out on an old window screen, or even a piece of corrugated roofing metal, and let them dry for a few days in the sun. If you’re not planning on eating the nuts anytime soon, it’s best to store the meaty centers in the shells. Store them in a dry place in a container that is not sealed airtight. You don’t want your bounty to mold from trapped moisture. When the time comes to harvest the meats from the nuts, lay a nut on a flat rock, a brick, or other hard surface and strike it with a hammer. After a couple times you’ll quickly learn just how hard to strike the nut to crack the shell without smashing the tender meat inside. Use a nut pick, ice pick, or any pointed tool to pick the meat from the shell. Yeah, it sounds like a lot of work and it is, but the first time you make muffins or breads, or top a bowl of ice cream with nuts you collected and harvested you’ll swear the treat tastes better than any you’ve ever had before. While the goal here is collecting fall and winter’s edible bounty, it’s important to know a little about your quarry. Hickory trees have played an integral part in the United States development over the years because, in part, the trees grew quickly and resulted in durable wood. While walnut lumber is a favorite for furniture, hickory wood has been a staple for tool handles – hammers, axes, shovels, hoes, mauls, et cetera, and even baseball bats. The main industry in the small Missouri town where I grew up was a handle mill, a large sheet metal building full of lathes and saws all powered by a system of wide belts, pulleys, and shafts turned by a steam engine. The steam was produced by a repurposed train boiler heated by sawdust and waste scraps from the mill itself. As for the nuts, not all hickories are created equal. Shellbark or shagbark hickories are considered some of the best of the nearly two dozen species and subspecies. Unlike black walnuts, which are generally uniform from tree to tree, hickories can run the gamut from sweet to bitter with shells that are as firm as walnuts or paper thin. The terms “shagbark” or “shellbark” refers to the bark on the tree and not the coating on the nuts. Still, the distinctive exterior of the trunk will make identifying the preferred hickories easier. The leaves of a hickory are larger than a walnut tree but follow the same pattern of rows of opposing leaves pointed on the tips with a single pointed leaf at the end. Shagbark hickories usually have five “leaflets” per leaf, while a shellbark will have seven leaflets, three rows of two with the single leaflet at the end. The nuts, which usually grow in clusters of two or three, are covered by a thick green hull that’s much cleaner and easier to work with than walnuts. A third variety may have as many as nine leaflets. This is a pignut hickory, and another telltale sign is that the hull is thin and usually doesn’t pull completely away from the shell when drying. 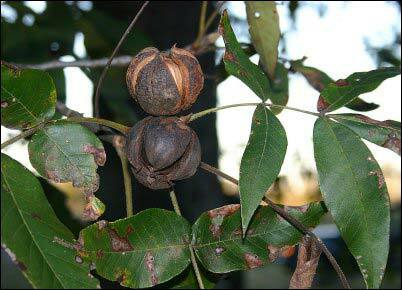 As hickory nuts dry and fall from the tree the outer hull will usually split into four sections and begin separating. Once the hulls dry and fall away it’s a sign the nut itself is drying and will soon be edible. As with walnuts, hickory nuts are best stored in the shell until ready to use. When that time comes you’ll still want to use a hard surface and hammer to crack the shell. Pick the meats from the cracked shells and you’re ready to enjoy. The third option to consider won’t be found as widespread as walnuts or shellbark or shagbark hickories. But in the areas of the country suitable to sustain them, pecan trees, a subspecies of hickory, are a nutter’s delight. The meats are always sweet and have countless uses in recipes. The nuts will grow on the trees in clusters ranging from three to nearly a dozen. The shells develop inside a green husk, which begins drying and splitting into four pieces in the fall. The pale brown nuts eventually drop to the ground. The leaves grow in an alternate pattern with fifteen or more leaflets. Technically a pecan is not truly a nut. It’s considered a “drupe” – a fruit with a single pit or “stone”. As mentioned before, when ready, the outer hull of a pecan will split into four sections and drop the pit onto the ground. Pecan wood is often used for furniture, wood flooring and for smoking meats. I keep a bucket of pecan blocks handy near my trailer-mounted smoker. A pecan tree can live and produce nuts upward of 300 years or more. While genetically altered varieties have been developed for commercial growth in orchards to meet the world’s demand for the great-tasting nuts, wild pecans are just as sweet as engineered varieties. As with all the nuts discussed so far, when you suspect pecans are dry enough to eat, crack one open and test the meat inside. Unlike walnuts or hickories, pecans shells can often be split by simply placing two together in your hand and squeezing them together. If you’ve been slacking in the your exercises lately you can always use a nutcracker, pair of pliers, or a hammer and hard surface. The tasty meats are great as toppings for ice cream, baked into breads, muffins or candies, or in a pecan pie. Here’s the first two tips to know about acorns before you run outside and gather enough to fill your pantry shelves. First, despite what you may have been told as a kid, acorns do not contain poison. That said, the second point is that they will often taste horrible. However, they contain good protein and energy. The experts assure there are more than 60 different oak species in North America alone. All of them produce edible seeds. All those species are generally divided into two types: white oaks and red (also called black) oaks. Both produce broad multi-lobed leaves. A little trick I was taught as a youngster in school is that red oaks have pointed leaf tips, representing the point of a Native American’s feather worn in his headdress. White oaks have rounded leaf tips, like the rounded top of a white man’s beaver pelt hat. Perhaps that tip wouldn’t be considered politically correct these days, but it’s helped me differentiate between white and red oaks for four decades. As for the nuts, the fruit of white oaks tend to taste better and be less bitter. The red oak acorns often contain more tannin, which gives them a more noticeably bitter taste. Another way to differentiate the nuts if the leaves have already fallen from the tree is to take a close look at the cap that tops the nut. Pop a cap off a nut and look inside. If the inner surface is smooth the nut likely came from a white oak. If it’s rough or fuzzy, it probably came from a red oak. White oak acorns tend to be larger in overall size as well. A good practice is to sample the meats of the nuts from a tree, and if they’re not too bitter than you start collecting right there. If they taste bitter simply move on to the next tree. Fortunately bitter acorns can be made more palatable by boiling the nuts for fifteen to twenty minutes, pouring off the water and adding fresh water, boiling again for another twenty minutes or so and repeat until the water has little discoloration after boiling. 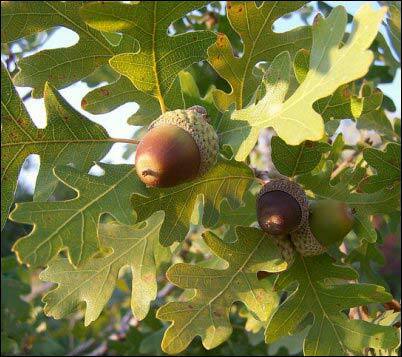 Even slightly bitter white oak acorns can be improved by boiling, and red oak nuts may take several changes of water before being table ready. Acorns can be dried and eaten raw, or roasted in a 275-degree oven for at least an hour, allowed to cool and then enjoyed or stored away for later use. Acorns can be chopped and used as toppings or additives for desserts or breads. Additionally they can be ground or pulverized into a fine powder, or “meal”, and used as a replacement for up to half of the flour called for in any recipe. As said at the beginning of this nutty saga, getting outdoors and hunting and gathering nuts can be not only a pleasant way to spend a crisp fall or winter day, but it can also be a rewarding effort as part of your annual provisions. Nuts are naturally easy to store for use at later times, making them the ideal topping and ingredient for the homesteader living more than a few blocks from the nearest grocery store. Here’s to happy “nutting” this winter.